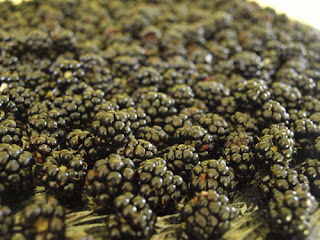 It was a rather wet start on Sunday, but when it dried up after lunch, I went out and noticed that there were a lot of 'brambles' which were ripe. I started to pick them, but once my hands were full, had to come back to the house for a bowl! I put most of the blackberries in the freezer but decided to keep some back to make a dessert. 5. 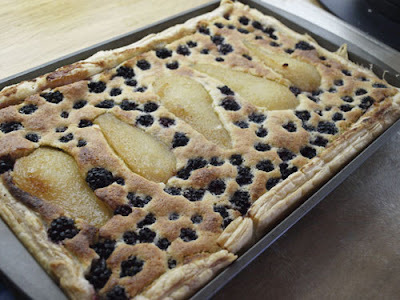 Add peached pears and sprinkle over the blackberries, push them down into the frangipane mix. 6. Bake at 170C for 20 minutes until risen and golden brown. I served the tart warm with icecream, but you can also eat it cold. If I was going to make this again I would make shortcrust pastry for the base as the puff pastry wasn't so good underneath especially when cold. 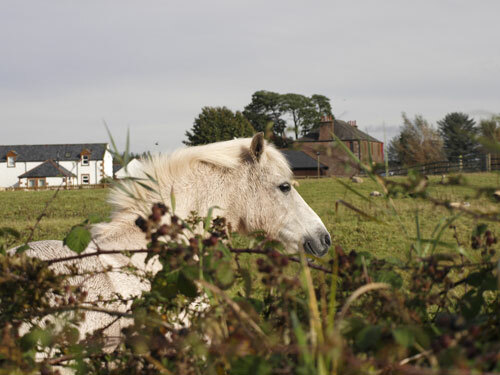 I had some company when I was out picking brambles, the horses in the next door field were very interested in what I was doing! what a sweet companion and what an awesome tart! That is a seriously impressive looking tart. Lovely. oh man alive what a tart!... I just adore the way all that wonderful gooey almondy batter rises up around the fruit... I think there's one or two backberry bushes still ripe around here so I must go hunting! That is my kinda tart Janice. I think this looks delish! I want to attempt to bake this!!! SNAP! Well, nearly! I made a peat, apple and bramble cake today, similar idea, but yours looks so much more elegant than my cake! LOVELY recipe idea Janice! Oooooooh, crikey. Well this looks quite amazing. A big rectangular slab of this with a hunk of ginger or whiskey ice cream - heaven! Your blog is beautiful, I love your unusual posts, so easy to get lost in them.